Dans la rue offers to homeless youth different housing options based on their needs. The Bunker is an emergency shelter that can accommodate up to 17 youth ages 12 to 21 years old. It gives them a break from life on the street so they can build up their strength, talk to trained counsellors, and find out how they can leave life on the street behind them for good. 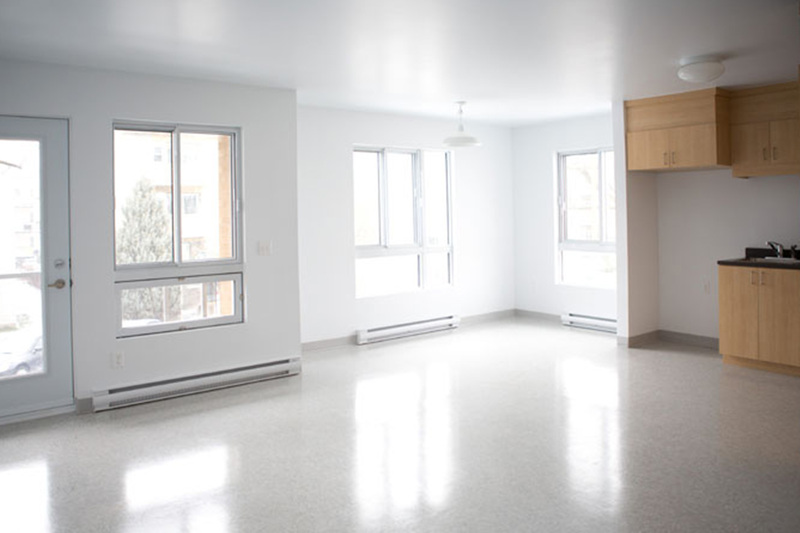 Since December 2014, 17 permanent housing units have been available to 15 young people and two families. This achievement was many years in the making – Pops long dreamed of it as a way of giving our youth a fresh start in life. Community support is offered within the building to promote socialization and combat isolation. Counsellors strive to ensure that this first housing experience is a positive one and to encourage youth to take advantage of the stability it provides to take concrete steps toward a better future, such as going back to school or finding a job. Unstable living conditions are a reality for the youth we serve. Without a credit history or resources to fall back on, it is difficult to find and keep an apartment. At Dans la rue, we strive to help young people aged 16 to 35 stabilize their housing situation by walking them through the various steps involved in renting an apartment. This requires an approach tailored to each youth’s specific situation and designed to promote independence, self-esteem and a sense of belonging, so they feel at home in their new living situation.